The Gau-Ehrenvorstand of the Bayerischer Inngau, Walter Weinzierl, and photographer Rainer Nitzsche collaborated on a fantastic new book called "Faszination Tracht." The 141-page book has 150 photos, each more beautiful than the last. The text is informative and clear. The Tracht is from the Inngau and Chiemgau regions and the photos were taken at various Gau- and Vereinsfeste in the area. A "must-have" for anyone who loves Tracht. The book can be ordered from Amazon and arrives in about 2-3 weeks. Here's the Amazon link. 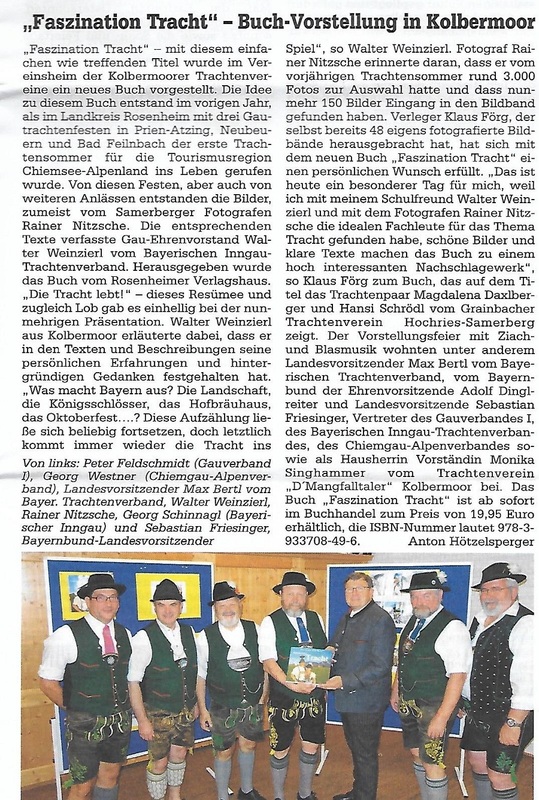 Below is a copy of the article that appeared in the Aug. 15 Heimat- und Trachtenbote about the introduction of the book.